Enjoying day one at the Society of Environmental Journalists conference in Madison, Wisconsin. 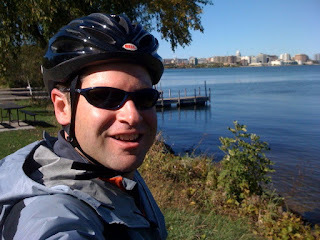 I wore myself out biking 30 to 40 miles this afternoon around the lake south of town and the hilly and beautiful University of Wisconsin campus, so I can't wait for the writers awards to finish up tonight. I'm going to go back to my hotel room and watch game one of the Cardinals' playoff series then hit the hay. Wisconsin Governor Jim Doyle claimed that his state's residents will be the first to drive their cars on ethanol derived from cheese waste. He told a story about a guy who works in rural Wisconsin in what looks like a little moonshine lab. Once he gets his pure ethanol, he takes it and mixes it directly into tanks in area gas stations. With approval from the gas station owners, I assume. And Tia Nelson, daughter of the founder of Earth Day, admonished her audience and demanded they to do better reporting on climate stories. She cited a recent study in which 900 peer reviewed articles found zero evidence that the climate wasn't being negatively affected by humans. In the same period, news articles gave as much space to climate naysayers as climate experts in 52 percent of the articles.